The most powerful release yet. Ignite your application design, development, and deployment with Skuid’s latest release, Spark. With Skuid, you can already create the applications that you and your users imagine. Now, with Skuid Spark, kick your projects into overdrive. Imagine if you could unite your enterprise silos, design engaging experiences for any device, and accelerate app development and adoption—all with one platform. Partner and customer portals, and more. Securely connect to any data, no matter where it rests—even if it’s behind your private network. Easily connect to even more data sources, including Microsoft’s SQL Server, MySQL, Postgres, Oracle, and more. 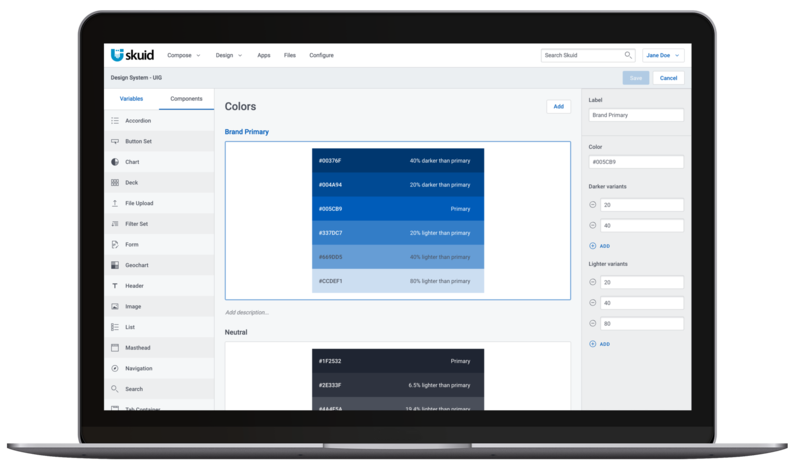 Gain powerful new declarative configuration options with all new Skuid Ink components, redesigned from the ground up to deliver complete style customization and accessibility compliance. Fully theme and brand apps with complete declarative control of comprehensive design systems, components and styles, without writing CSS or HTML. Deliver rich mobile experiences with all the most useful native mobile features at your fingertips. Ready to get started? Start creating what you imagine today. © Copyright 2018 Skuid, Inc.